VATICAN CITY (CNS) — Cardinal Leonardo Sandri, 69, may have very little direct pastoral experience, but remarks he made to a group of U.S. bishops last year seem to show he knows the church has an image problem, and it’s up to the church to fix it. “Many people today have come to doubt that there is still holiness or honesty in the church and in the clergy. 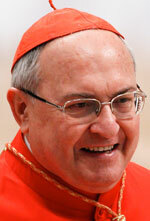 We must prove them wrong,” he told a group of Eastern Catholic bishops from the United States. “We can be a true community of saints who shine as models of chastity and charity before a culture in great need of this witness,” the cardinal told the bishops, who were making their “ad limina” visits to the Vatican. As journalists and pundits began looking at cardinals likely to be influential in the coming conclave or for cardinals who might be considered candidates for pope, Cardinal Sandri’s name was mentioned frequently. He is Argentine, but with strong Italian ties; and as a member of the Vatican diplomatic corps and longtime Vatican officials, he knows how the Roman Curia works, so could perhaps address some of its problems. But some observers have expressed concern over his apparent ties to the Legionaries of Christ in the period before May 2006, when Pope Benedict ordered Father Marcial Maciel Degollado, the Legionaries’ founder, to stop exercising his priestly ministry publicly after the Vatican found evidence to support long-standing claims that he sexually abused minors. While he was not in a powerful enough position at the time to protect Father Maciel from Vatican disciplinary action, Cardinal Sandri frequently attended Legionaries of Christ events, and he presided over their ordinations in 2002. Since 2007, the cardinal has served as prefect of the Congregation for Eastern Churches, which assists the 22 Eastern-rite churches in full union with Rome, as well as helping Latin-rite Catholic dioceses in parts of North Africa and throughout the Middle East. Addressing the Synod of Bishops on the new evangelization in October, Cardinal Sandri said that in their homelands, many Eastern Catholics face physical danger and threats to their religious freedom. Many of them seek freedom and safety for themselves and their families in the West, but have difficulty acclimating or maintaining their faith in societies that seem to have forgotten God exists. Before being named prefect, Cardinal Sandri was the “substitute secretary for general affairs” in the Vatican Secretariat of State. The position is similar to a president’s chief of staff, placing him in charge of the Vatican’s day-to-day operations. In the last days of the pontificate of Blessed John Paul II, when the pope no longer had the stamina to read his own speeches, Cardinal Sandri became the voice of the pope. And it was Cardinal Sandri who told people gathered for prayer in St. Peter’s Square April 2 that the pope had just died. Born Nov. 18, 1943, in Buenos Aires, Argentina, to parents of Italian descent, he was ordained a priest for the Archdiocese of Buenos Aires in 1967. After earning a degree in canon law, he entered the Vatican diplomatic corps in 1974 and served at the Vatican Embassy in Madagascar. From 1977 to 1989, he worked at the Secretariat of State, then was assigned to the nunciature in the United States for two years. In 1991, he returned to the Vatican for six years before being named an archbishop in 1997 and being sent to Venezuela as nuncio. In March 2000, he was named nuncio to Mexico, but six months later was called back to the Secretariat of State to take up the position overseeing the Vatican’s general affairs.